I'm a digital artist working at the intersection of art and technology, currently Senior Senior UX Designer at Spreadshirt. It is a great example of making the Minimum Viable Experience accessible in a specific context, which in this case is very device specific. 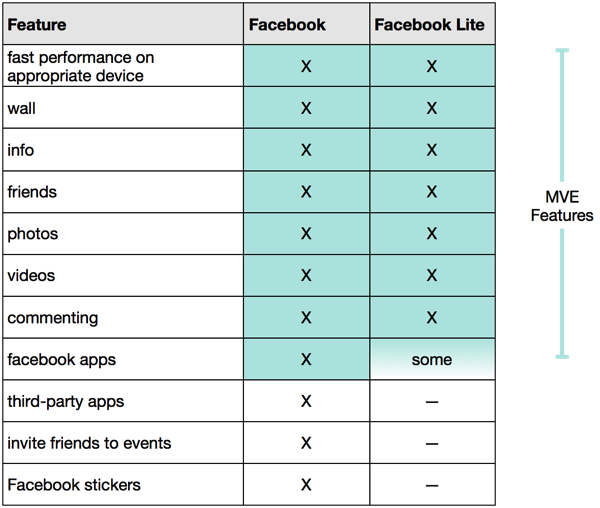 Comparing the features of Facebook Lite at launch with the main-stream Facebook android app gives us insight into what featured are deemed core to the experience and which ones are optional enhancements. Based on user-research, personas and business requirements, the experience a product should facilitate can be defined. When it is time for implementation, it is important to separately define the minimum viable experience and the features it requires as well as the maximum viable experience, the ultimate vision of a perfect world. These extremes will help negotiate optimization efforts for each use-case, context and the resulting constraints and opportunities. In Facebook’s case the context was mobile usage on early-generation Android phones with slow and spotty connections. 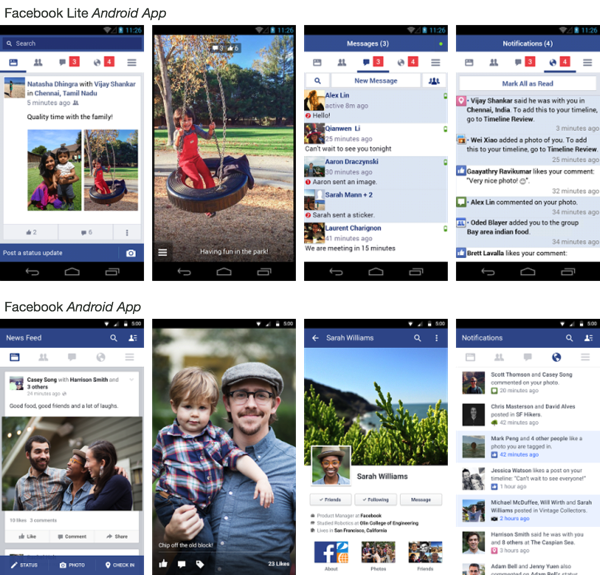 As we can see from the feature comparison the core experience was defined around the Facebook Wall and user interaction. Bells and whistles like stickers were omitted as non-essential as were most apps. Another interesting insight is the commission of some event-related features, like inviting a friend. When designing for the multi-device reality, the mobile-first approach has some helpful tools to offer. it forces us into a linear prioritization of features. This is incredibly helpful not only for product managers as they create their backlogs and roadmaps, but also for defining the MVE and the resulting minimum viable product (MVP). Gather input around those features from stakeholders and users and draw the line after considering the impact and necessity of each included and omitted feature. The MVE should be made accessible on all devices and channels, but all non-essential features can be added along the prioritized feature list and under consideration of use-case and context of the target environment. The nature of your product as well the resources available to you will determine how many of your users in each use-case will be presented with a minimum viable experience (Facebook’s Lite version) or a more optimized version with additional features that improve the experience. GradeGuru Citation Manager was created for students to efficiently manage references for papers, essays and assignments. But it can serve you just as well in your work when you are doing competitor research, trend analysis and anything where you want to keep track of your sources.